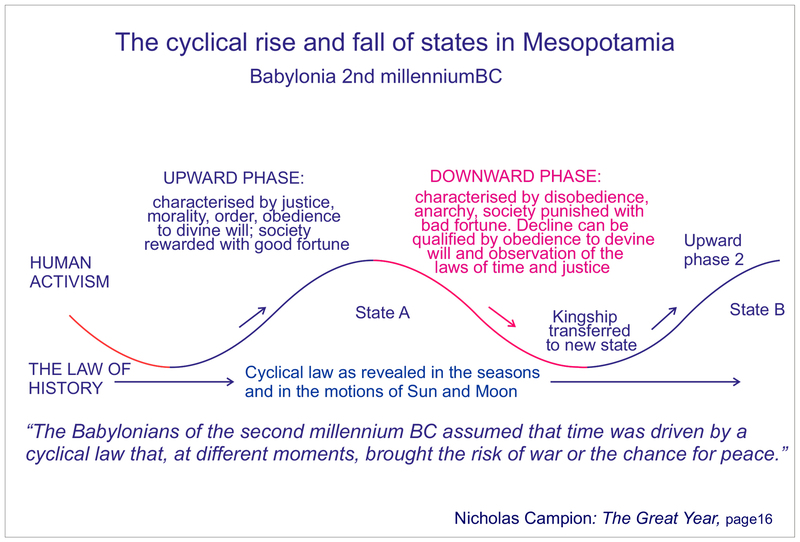 The Babylonians of the second millennium BC assumed that time was driven by a cyclic law that, at different moments, brought either the risk of war or the chance for peace. Mundane astrology is the most ancient form of astrology known and therefore has been named ‘The Mother of all Astrology’. The earliest recorded data is from Mesopotamia , mid- Second Millennium BC, approximately 3500 years ago. 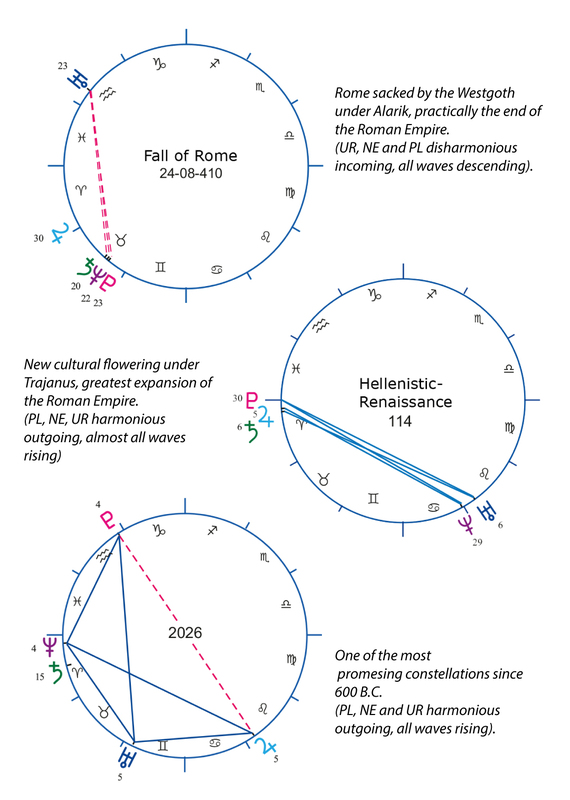 The above diagram is from Nicolas Campion’s book The Great Year, Astrology, Millenarianism and History in the Western Tradition. (Arakana, Penguin, 1994), a monumental work of historical theories about the character of the times in relation to cosmic factors and all the various related ideological constructions and philosophies. In short, a cultural treasure chest of all western theories, as well as those of non-western origin that were adopted by successive cultures, to determine their place in relation to the cosmos. That is mundane astrology. To illustrate this, I’ve used a quote from Campion’s book. As indicated in the diagram above, it had already been noted in mid-Second-Millennium BC Mesopotamia, that the character of the times was determined by cycles of heavenly bodies. This principle was conceived as a wave-like motion related to processes such as the rise and fall of civilisations, war and peace. This simple representation of affairs would resurface more than a thousand years later in Greek philosophy e.g. Plato (The Great Year) and Aristotle. The following diagram (Fig.1 ) illustrates modern perception of an insight which originated in Ancient Mesopotamia. The simplicity is unchanged. It relates to the cyclic link between two planets i.e. 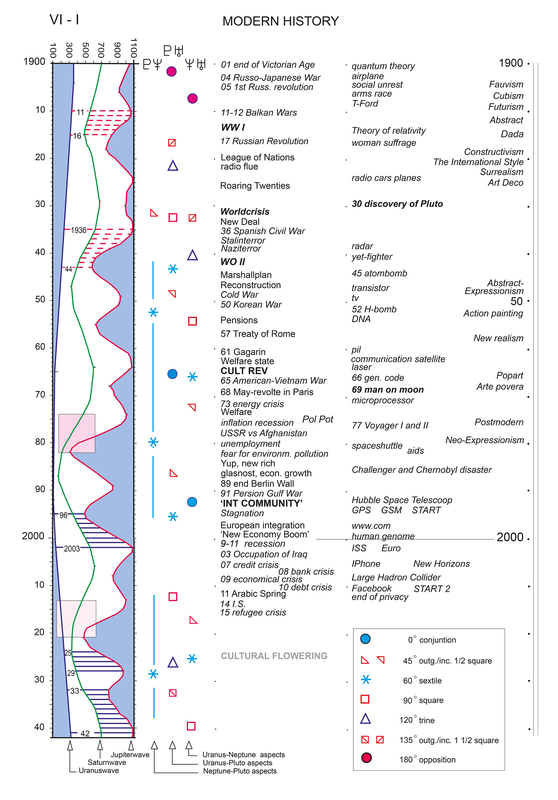 the synodic period. 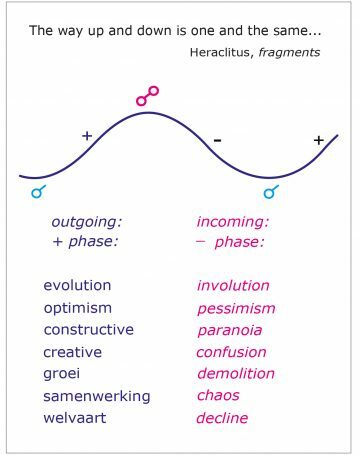 Between the conjunction and the opposition there is an outgoing phase (+) and between the opposition and conjunction an incoming phase (-). This can be compared to the phases of the Moon. Between New Moon and Full Moon the moon is in a waxing phase and subsequently waning. The guiding principles are somewhat less profoundly formulated than 3500 years ago but are easy to understand and the basic concept remains the same. Naturally, the burning question now is whether the simplicity of this concept can be retraced throughout history. In order to find out, I used my own version of Barbault’s ‘Cyclic Indication’. This is based on the cyclic link between the five outermost planets. Why these and not the inner planets? In astrology Pluto, Neptune and Uranus are known as ‘Collective Planets’. 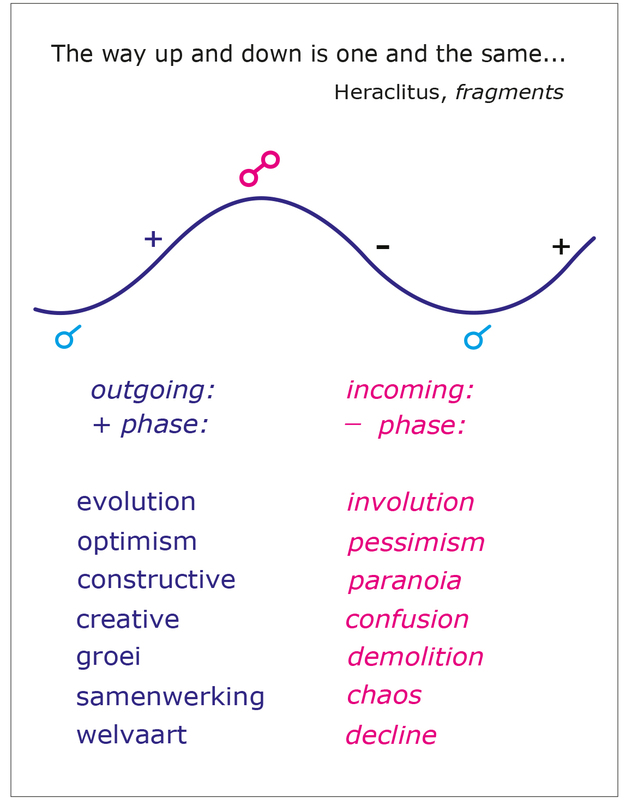 Their cycles correspond to long-term cultural- historic periods. Saturn and Jupiter are the so-called social planets which relate to social-political and economic developments. These 5 planets form 10 cycles (waves) with one another, which is rather a lot to oversee. On the other hand, a single wave, as in Barbault’s Cyclic Indication would be too little. Therefore I have developed the following method. Taking 2000 (March 21) as an example, we begin with the cyclic index of Uranus. To achieve this the distance (angle) is first calculated between Pluto and Neptune, that is, 53 degrees. To this we add the angular separations of Uranus-Pluto and Uranus-Neptune, respectively 66 and 13 degrees, obtaining a total of 132 degrees. The graph begins at 100 degrees; a point is set for Uranus at 132. To obtain the cyclic index of Saturn, the angular separations of Saturn-Pluto, Saturn-Neptune and Saturn- Uranus are added to 132. These calculations are made for each of the 300 years. The points are set out on a graph. Because the term ‘cyclic index of Uranus’ etc. is rather a mouthful, I will from now on use the terms Uranus wave, Saturn wave and Jupiter wave. We can see on this graph how the Uranus wave drives the Saturn wave up and how this in turn strengthens or weakens the peaks and lows of the Jupiter wave. As example I have chosen the worst possible scenario. .. War. 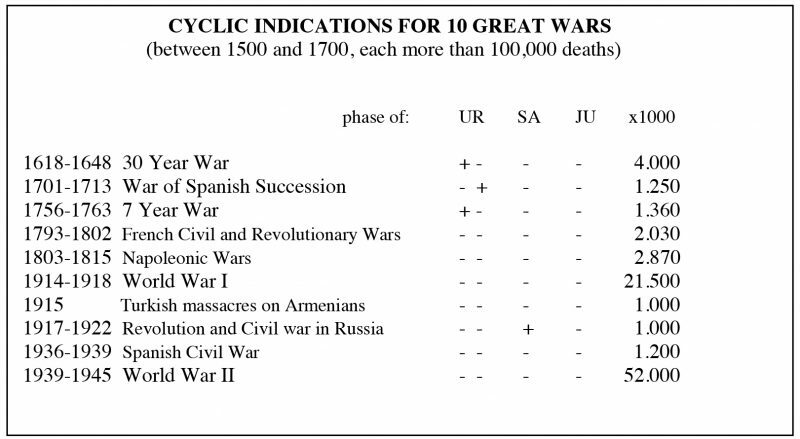 Here is an overview of the bloodiest wars between 1700 and 2000. Three waves are shown. 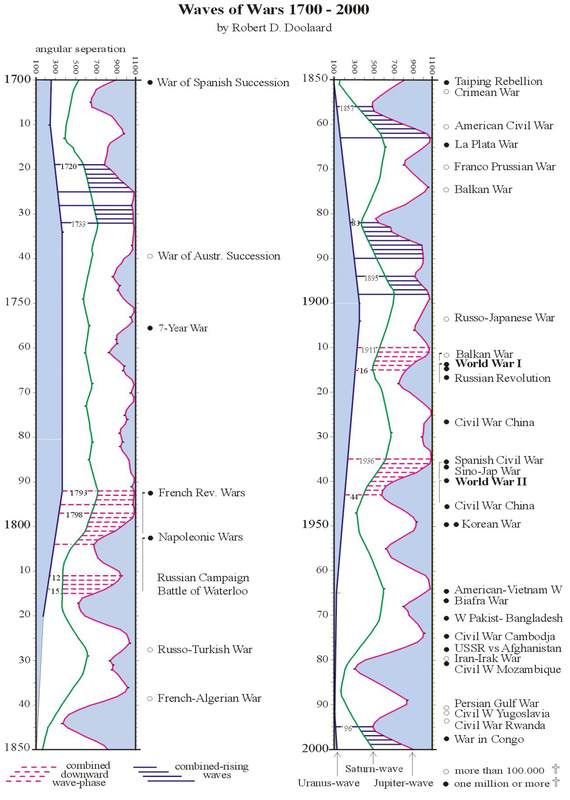 Where they are linked by broken lines indicates when the three waves are simultaneously in the descending phase, parallel with the French Revolution Wars, the Napoleonic Wars and the two World Wars. The Balkan Wars and the Spanish Civil War, which broke out at the beginning of the joint descent, are both considered as foreplay to the successive world wars. When the wave is descending the respective planet is primarily moving towards its conjunctions with slower planets (incoming, or descending phase); when it rises then the planet is primarily moving towards its oppositions (outgoing or ascending phase). In the graph below, one can see that in the past 90 years, during periods when the Jupiter wave starts to be descending, a serious war breaks out. Therefore it was not difficult for me to foresee the outbreak of war in 1991 and 2003. Those were the years in which the ‘Bush Wars’ began, in an attempt to secure the U.S. supply of oil from the Middle East. We are perhaps fortunate that it will only be in the ‘70’s of this century that all the waves will be jointly on the descent again. The following figure shows all the European mega-wars from 1500 AD until now. Together these have been responsible for 95% of all deaths in all the European wars in this period! These 10 terrible catastrophes in the past are marked with 40 signs, either minuses or plusses. The two signs under UR relate to the Uranus-Pluto and the Uranus-Neptune cycles respectively. When all is well the plusses and minuses are in equilibrium, therefore for both there should be about 20, arbitrarily divided. However, here we see only 4 plusses as opposed to 36 times minus. This extraordinary contrast led me to the conclusion: The worse the war, the more often it breaks out during the downward phase of the cyclic indexes (Catastrophe Effect). Let us now look at the present time and the coming decade. 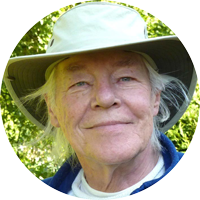 Intrinsic to the wave-movement are the aspects which provide the character of each moment during a cycle. 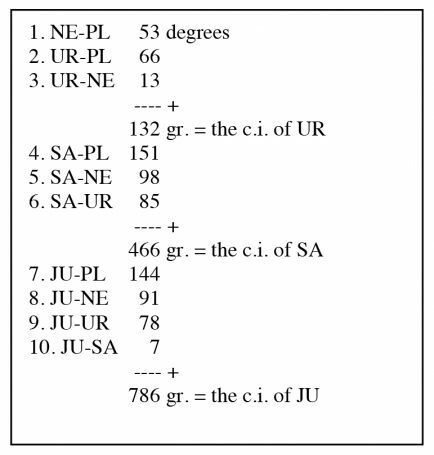 These are registered in three columns (see fig. 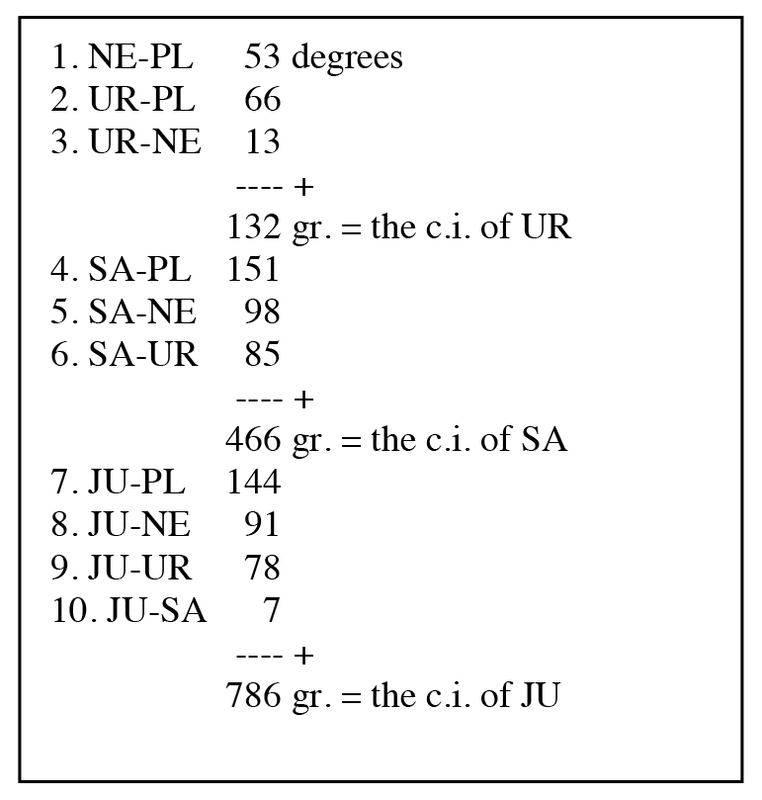 6) which show the correlating cycles between PL, NE and UR. As well as using the major aspects I have also included the tension-filled minor aspects of 45 and 135 degrees, the half- and one and a half squares. The importance of this addition is clearly demonstrated by, for example, the resulting world crisis following the Wallstreet Crash at the end of 1929. Apparent at that time is an incoming half-square between Pluto and Neptune, an incoming square between Pluto and Uranus and subsequently an incoming one-and -a half square between Uranus and Neptune. Not only did the capitalistic world go bankrupt but we see that from that time onwards National Socialism (fascism) grew. During such aspects between the ‘Mystery Planets’ civilisation appears to enter a paranoid-schizophrenic phase, especially in countries in which frustration and demoralisation are greatest in such a period, as in Germany that was burdened by the harsh terms of the Treaty of Versailles. In these three columns with aspects a blue circle is marked twice. These indicate conjunctions, which always reveal a new cultural period. In 1965 it concerns the Uranus-Pluto conjunction and in 1993 the Uranus-Neptune conjunction. That of 1965 occurred simultaneously to the ‘60’s’, an anti-autoritarian, socially-critical, engaged period , full of happenings and resulting in a greater individual freedom. The Uranus-Neptune conjunction of 1993 marks the beginning of globalisation, the disappearance of frontiers through, among other factors, satellite communication (internet) and neo-conservative world trade system that has been dubbed ‘Mac World’. Please note that these two conjunctions form the prelude to the development of the Pluto-Neptune cycle which began in 1892 in Gemini. It is since the Uranus conjunctions with these other two planets that there is mention of an ‘information society’. Following the prosperous second half of the 1990’s which coincided with unanimous rising wave moment, it all went wrong from the first oppositions involving a social and a mystery planet since many years. The opposition is at the top of the wave and thereafter can only go downwards. In 2000 Jupiter reached its first opposition for 11 years, with Pluto, after which the soaring stock exchange fell dramatically. The end of optimisme. It will not come as a surprise that Jupiter-Pluto plays a part in the greatest gambling-hall ever; the Stock Exchange, or that Saturn and Pluto dwell in the underworld of political power. From 2003 we have been in the descending phase of the Jupiter wave. Since then the general uneasiness and distrust has only increased. The results of the American foreign policy, in particular the occupation of former Mesopotamia , are extremely worrying. When we compare the current Jupiter and Saturn wave to that during the American intervention in Vietnam, strong similarities can be seen. If the USA is unable to end the conflict before 2007, when the Saturn wave begins to descend, it could worsen and end in hopeless tragedy. Not a new World War, since they have only developed when all the waves are on the descend and the next time that happens is in 2077. The Uranus wave has been ascending since 1993. This coincides with an even greater speed in the technical innovations brought about since the 1965 and 1993 conjunctions. The outgoing square of Uranus to Pluto around 2013 may well cause an excess of tension, resulting in accidents in our technologically-controlled world. A new solution will only just have been presented before the next, even more advanced, system appears. Rather like what we are experiencing today, but then in manifold form. In stark contrast with this scientific and technological creativity stands political power (descending Saturn wave) in whose reorganisation of society is introducing a form of 19th Century Darwinism (Survival of the Fittest), for which many are understandably afraid. In the meanwhile the sea level is rising, the pressure on the environment is increasing, oil reserves are being depleted, everyone is getting older and the stock exchange is stagnating for the coming two decades… However, life goes on , even if its course is not always of our chosing. It will have become clear that from the beginning of the 2020’s, a new period begins. Shown here in Fig. 7 is the striking constellation of 2026, formed by the outer planets. In order to place this in historical perspective, it is necessary to have studied the longer cycles of the outer planets. A Pluto-Neptune cycle lasts almost 500 years. Therefore, to compare it to the preceding PL-NE cycle, it is a consideration of periods of thousands of years. The cycles of Uranus weaves throughout, a magnificent and powerful trio whose propelling rhythm accompanies the dramatic adventures of the human race. Knowledge of the above, described in greater detail in my book ‘Waves’, is essential to any serious study of mundane astrology. 1. An incoming negative aspect between Pluto and Neptune, or a conjunction which is vulnerable through its receptivity. 2. Tense (hard) incoming aspects of Uranus to Pluto and Neptune. 3. All (3) waves are descending. 1. A harmonious, often outgoing aspect between Pluto en Neptune, preferably long-lasting, as in the present period. 2. Gentle, harmonious outgoing aspects of Uranus from Pluto and Neptune. 3. All the waves ascending. The second constellation of 114 AD shows exactly the opposite. Until now it has been the best constellation ever. However, that of 2026 is even more positive, since it will meet all three of the positive conditions as described above, in contrast with the constellation of 410 AD which reveals the seriousness of the three negative conditions. History is written in between these extremes, between death (disintegration) and resurrection (renaissance), under the rhythmic guidance of our solar system. Contact Robert for questions about his research or to learn more about his lectures. A former student of the Rotterdam Art Academy, he spent many years of his life working as an artist-painter. From 1962 he studied astrology, his particular interest centring on mundane astrology. In 1986 his book Waves was published by Ankh-Hermes. In this, Robert Doolaard described his unique research into the correlation between planetary cycles and the peaks and lows in recorded history over the past twenty-six centuries. According to Doolaard, civilisation consists of the collective effort by humankind to rid the world of suffering. Both the successes as the failures of this effort run parallel to differentiable phases of planetary cycles. He therefore also refers to this original new vision into our past as planetary-cyclic historiography.